Summers have arrived here at Bandhavgarh. It’s March and the dry deciduous forest trees have already started shedding their leaves. The forest bed and the safari routes are garnished with their dry manor. Their crackling sound on early morning drives feels welcoming to the jungle. A mild breeze showers the dry leaves on safaris. Driving into this park was always my dream and it came through with Pugdundee Safaris. 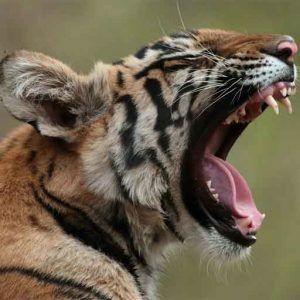 Bandhavgarh or Bandhogarh (Brother’s forth) as popularly known is the Land of tigers. I seldom feel alone on my drives as somewhere or the other a pugmark will follow my path or an alarm call will munch from nowhere. The whole park gets alive when tigers move. But before here tigers have always played hide and seek with me during my drives in the South Indian jungles. It was the elusive leopards which bestowed some amazing sightings during my 3 year stay into the Western Ghats. And we used to watch out on tree bends, branches and alarm calls to track and spot them. Tiger sightings while most of the time was by sheer luck or sometimes by good tracking. But it doesn’t mean at all that we have less tigers there, I would say it’s probably the terrain, larger tiger territories, water availability and dense forest cover which made them subtle. I can still count on my finger tips the number of tiger sightings which I had from the south while here in Bandhavgarh National Park. I am going to beat all my previous records. May be that’s why many wildlife enthusiasts prefer visiting Central and North Indian jungles for sighting this charismatic animal. And summers are meant for that!! 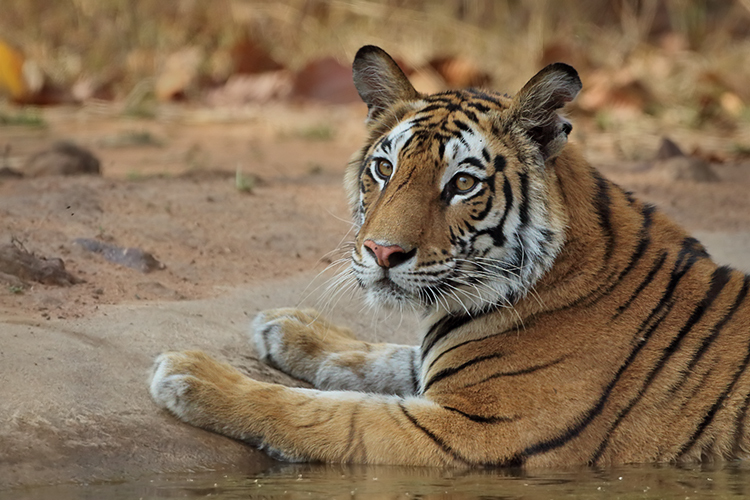 Tigers are fond of water and usually to cool off themselves during summers. The quench for thirst inveigles them to come out in the open ponds, lakes and other water bodies. Central Indian jungles are known for the summer heat and greater visibility. 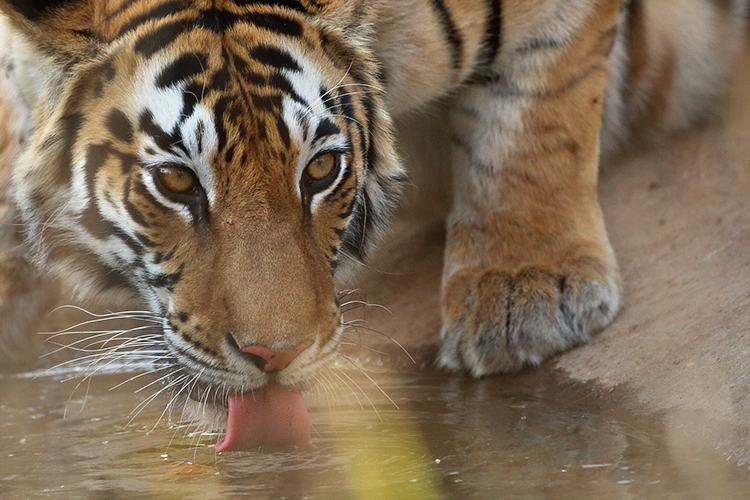 Tigers can drink water for 15-20 minutes at a time. 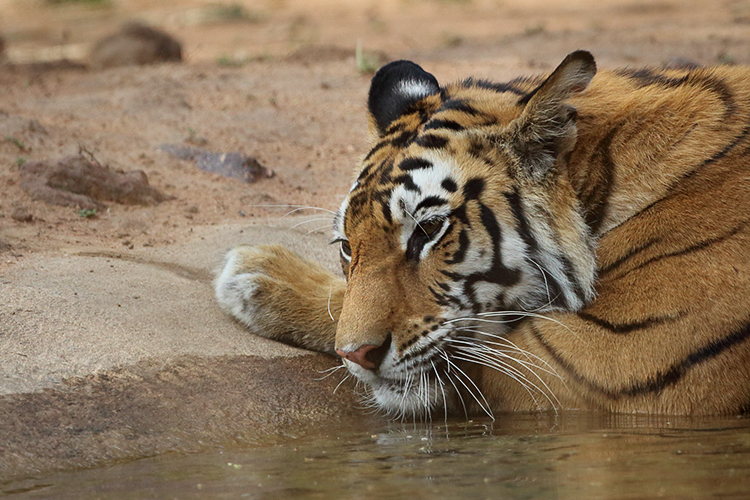 This was one of my sightings of Rajbehra female sub adult cub, almost 3 years or so at one of the better known water holes ‘Tadoba’ (It got its name from Tadoba National Park, Maharashtra where manmade concrete water saucers are frequently used by tigers). This female has occupied the Tadoba waterhole area after the denial from her mother (Rajbehra Tigeress who has moved back to her Rajbehra meadow area) and has been frequently spotted by tourists in the Magadhi Zone. A new male from Khitauli also frequently visits this zone and I hope she mates with him soon. Let their tribe grow in abundance. Posted on March 23, 2015 by pugdundee blog. This entry was posted in Animals, Wildlife and tagged Bandhavgarh National Park, Bandhavgarh tiger reserve, land of tigers, pugdundee safaris, rajbehra tigress, tigers of bandhavgarh, wildlife safari in india, wildlife tiger tour. Bookmark the permalink.